HauteLook.com is offering a coupon code for $25 off a $50 purchase. You can get some really amazing deals with coupon code 25OFF50HL. I just checked into getting Em some wet weather gear from Kidorable and I would get a great deal with this coupon. 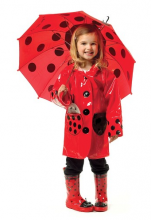 I would get a rain coat, rain boots, and umbrella for $40 shipped! If you haven’t checked out HauteLook.com head over there now to sign up for your free account. You might find some really fun holiday gifts. Have you signed up for HauteLook.com yet? I love to drool on all the great deals they have. Today, Plum District has a great offer for HauteLook.com. Get $50 to spend at HauteLook.com for only $25! This would make a great gift. If you haven’t been over to HauteLook.com yet, check them out here first to see if there are any deals you might be interested in. I actually bought this deal. They have a great pair of brown “flat” boots that have my name all over them. Counting the amount spent on the voucher I’ll pay $33 for $120 pair of awesome boots! Yay!